The Age of Steam Roundhouse of Sugarcreek, Ohio, is happy to announce the acquisition of its 20th steam locomotive, former Columbus & Southern Ohio Electric Company 0-4-0F No. 2. The locomotive had been owned by Travel Centers of America, and displayed at a closed-down restaurant on TCA property in Sharon, Pennsylvania. 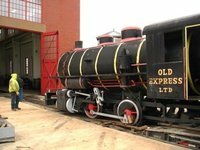 New plans for the property did not include the old locomotive, so AoSRH offered to purchase the engine and preserve it indoors at AoSRH’s beautiful locomotive display and restoration facility in Sugarcreek. The locomotive was tightly squeezed between a city street and an old railroad station—and, with electric power lines hanging overhead—made removal difficult. However, because the site was to be cleared, the locomotive’s removal was postponed until there were no obstructions. 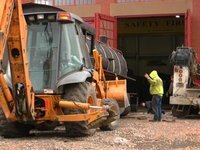 A highway truck was backed-up to the engine, and the 54-ton 0-4-0F was winched aboard the lowboy trailer for its trip to the Age of Steam Roundhouse. Days before loading No. 2, members of the AoSRH staff removed the locomotive’s side rods and made other preparations. After a 112-mile trip from its display site in Sharon, 0-4-0F No. 2 reached AoSRH’s facilities in Sugarcreek on January 23, 2018. 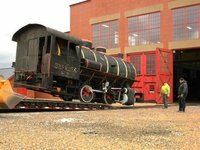 “We’ve been looking for a fireless cooker steam locomotive to add to our collection,” said Tim Sposato, chief mechanical officer at the Age of Steam Roundhouse. “We were fortunate to locate and obtain one that was in our own backyard. That saved us a lot of money in loading and transportation costs.” The AoSRH’s newest locomotive was loaded and transported by Zemba Brothers Construction of Zanesville. Constructed by Heisler Locomotive Works in 1940, this little locomotive is a “fireless cooker” type of switcher that was popular for use in areas where flammable substances were handled, such as in textile mills, chemical plants and coal-burning power plants. Fireless locos operated without the need of a fire to heat boiler water to make steam. Instead, these engines used heavily insulated boilers to store pressurized steam and hot water that were supplied from a separate source. At normal atmospheric pressure, water boils at 212 degrees Fahrenheit, but does not boil and will not make steam when under pressure. As the fireless locomotive performs work and uses steam, the boiler pressure drops, thus allowing the superheated water to start boiling again and make additional steam. When the steam pressure rises, the superheated water stops boiling and the entire process is repeated over-and-over. When the quantity of water and steam inside the boiler was used-up and reduced to the point where the boiler needed refilling, the locomotive would have been recharged from the separate source. Typically, a fireless cooker could be operated for about eight hours on a single charge of superheated water. Before being shipped to Youngstown, former C&OSE 0-4-0F No. 2 was weighed at C&O’s Parsons Yard in Columbus, and an actual weight of 108,100 pounds was recorded on its freight waybill. This loco’s boiler had 250 psi in its boiler, which was reduced to 75 psi for use in its 21”x20” cylinders to turn small 36-inch driving wheels. As such, No. 2 developed just 14,700 pounds of tractive effort. Though not very powerful, this fireless locomotive had to move only a few loaded or empty coal hopper cars at any given time—why pay for more tractive effort than would ever be needed? Used at C&OSE electric generating plant in Groveport, Ohio, 0-4-0F Nos. 1 and 2 were retired and donated to the Penn-Ohio Railfan’s Association. Both locomotives had their main and side rods removed, and were moved on their own wheels in freight trains during the August 27-31, 1965, trip across Chesapeake & Ohio and Erie-Lackawanna tracks to Youngstown. However, the removal of the locos’ rods caused imbalance in their 36-inch driving wheels, and while en route No.2 developed bearing trouble and had to be loaded onto a flatcar for the remainder of the journey. For several years these two fireless locos were stored in a field south of Canfield, but No. 2 was acquired by the Old Express restaurant in Sharon, Pa., and moved to its diner display site on June 13, 1974. Former C&SOE No. 1 is owned by the Mahoning Valley Railroad Heritage Association, and, along with historic steel mill railroad cars, is displayed in Youngstown. Additionally, a third C&OSE 0-4-0F fireless cooker—No. 3, built by Vulcan—is on exhibit today at the Dennison Depot Railroad Museum. 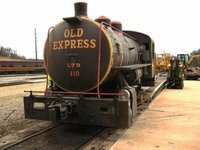 The Age of Steam Roundhouse will cosmetically restore its newly acquired 0-4-0 fireless cooker back to its original appearance as Columbus & Southern Ohio Electric Company No. 2.